Explanation: NGC 134 is probably not the best known spiral galaxy in the constellation Sculptor. Still, the tantalizing island universe is a clearly a telescopic treasure in southern skies. It shares a bright core, clumpy dust lanes, and loosely wrapped spiral arms with spiky foreground stars of the Milky Way and the more diminutive galaxy NGC 131 in this sharp cosmic vista. From a distance of about 60 million light-years, NGC 134 is seen tilted nearly edge-on. It spans some 150,000 light-years, making it even larger than our own Milky Way galaxy. NGC 134's warped disk and faint extensions give the appearance of past gravitational interactions with neighbouring galaxies. 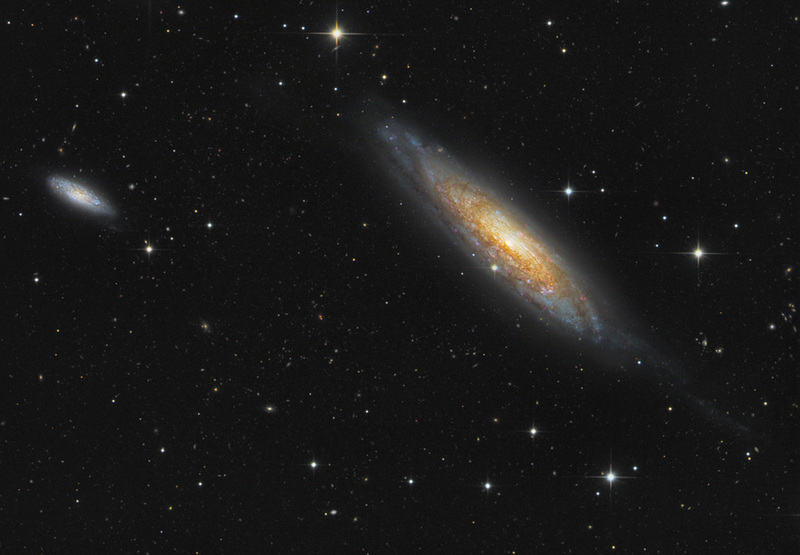 Like the much closer and brighter Sculptor galaxy NGC 253, tendrils of dust appear to rise from a galactic disk sprinkled with blue star clusters and pinkish star forming regions.